A grasshopper landed on the canvas above with an audible thump. I eyed it narrowly, but it didn’t seem disposed to come inside, thank goodness. Perhaps I should have accepted Mrs. Bryan’s offer to find me a bed in the house, along with a few other officers’ wives who had accompanied their husbands. Jamie had insisted upon sleeping in the field with his men, though, and I had gone with him, preferring a bed involving Jamie and bugs to one with neither. I glanced sideways, careful not to move in case he was still asleep. He wasn’t. He was lying quite still, though, utterly relaxed, save for his right hand. He had this raised, and appeared to be examining it closely, turning it to and fro and slowly curling and uncurling his fingers—as well as he could. The fourth finger had a fused joint, and was permanently stiff; the middle finger was slightly twisted, a deep white scar spiraling round the middle joint. His hand was callused and battered by work, and the tiny stigma of a nail-wound still showed, pale-pink, in the middle of his palm. The skin of his hand was deeply bronzed and weathered, freckled with sun-blots and scattered with bleached gold hairs. I thought it remarkably beautiful. He let the hand fall on his chest, and turned his head to look at me, smiling. I laughed and rolled onto my side, kicking the blanket off. The air was still delightfully cool, but it wouldn’t last long. “Do you expect to disintegrate much further before supper?” I asked, teasing. “Oh, I dinna suppose anything is likely to fall off by then,” he said, consideringly. “As to the workings… aye, well…” He arched his back, stretching, and sank back with a gratified groan as my hand settled on him. I let him keep hold of the hand, but shifted to set my chin in the center of his chest, where a small depression seemed made for the purpose. I lifted my chin from its resting place and looked him over carefully. It was in fact rather hard to look at him objectively; I was both so used to his features and so fond of them that I tended to notice tiny, dear things about him—the freckle on his earlobe, the lower incisor pushing eagerly forward, just slightly out of line with its fellows—and to respond to the slightest change of his expression—but not really to look at him as an integrated whole. He bore my examination tranquilly, eyelids half-lowered against the growing light. His hair had come loose while he slept and feathered over his shoulders, its ruddy waves framing a face strongly marked by both humor and passion—but which possessed a paradoxical and most remarkable capacity for stillness. He gave a small grunt of amusement, but lay still. I could hear one of the cooks stumbling round nearby, cursing as he tripped over a wagon-tongue. The camp was still in the process of assembling; a few of the companies—those with a high proportion of ex-soldiers among their officers and men—were tidy and organized. A good many were not, and tipsy tents and strewn equipment sprawled across the meadow in a quasi-military hodgepodge. Jamie’s free hand rested on my back, his thumb idly stroking the edge of my shoulder blade. With his usual capacity for mental discipline, he appeared to have dismissed the uncertainty of the military prospects completely from his mind, and was thinking of something else entirely. “Do ye ever think—” he began, and then broke off. “Think what?” I bent and kissed his chest, arching my back to encourage him to rub it, which he did. His hand on my back paused for a moment. “Aye, that’s it.” He sounded a little surprised. “I kent more or less what it would be like to be a man of thirty, or of forty—but now what?” His chest moved briefly, with a small noise that might have been a mixture of amusement and puzzlement. His hand was warm and heavy on my back. He felt the tears that ran unexpectedly from the corners of my eyes to dampen his shirt, and his other hand came up to touch my head and smooth my hair. “Aye, that’s it,” he said again, very softly. The camp was beginning to stir outside, with clangings and thumps, and the hoarse sound of sleep-rough voices. Overhead, the grasshopper began to chirp, the sound like someone scratching a nail on a copper pot. I sighed deeply and turned my head, to rest my cheek against his chest. He reached over gently and wiped my nose with a fold of his shirt. This excerpt from THE FIERY CROSS is Copyright © by Diana Gabaldon, all rights reserved. It was also posted on my official Facebook page on January 11, 2019. About reposting my excerpts (aka “Daily Lines”) from any of my books and short fiction, I’d appreciate it very much if you would NOT copy my them (word for word—in part or in their entirety) and post the text yourself all over the internet (including web pages and social media accounts) or anywhere else. These are copyrighted works. Instead, please do pass on the links (aka “URLs”) to my website and specific excerpts to anyone you think might be interested. I am sorry to learn of the loss of your beloved dog. It is hard. You have my sympathy and, I hope, empathy. I just cannot fathom a mind that can create such beautiful, tender, and touching passages! Amazing, (and you always make me cry!) Oh the depth of imagination that you possess ! You are a genius Diana! Happy Birthday! Happy Birthday Diana! Many more blessed years to you! You are such a blessing to so many people!!!! family, friends and tons of fans!!!! I love your books! I was wondering if Jamie not hearing the stones has something to do with Dougal’s attempt to kill him. That attack left Jamie tone deaf. I was wondering if that may be why he can’t hear the stones. Therefore, is it possible that Jamie may still have the ability to time travel after all? So I think it’s no, no, and no to your questions. Wait…..that part about Clair in the B & B when she’s looking out the window and their is a man staring up at her. Before the whole time travel started. That wasn’t Jaime? So, we’ll see in a few years! Diana has also said that Book Ten will likely be the last of the Outlander series featuring Jamie and Claire. Happy belated birthday! I’ve just finished the last of novel and I’m wondering when the next one will be out? Love all the books in the series on TV !! Diana has said that Book Nine, GO TELL THE BEES THAT I AM GONE, nicknamed “BEES,”will probably be finished some time this year, maybe by mid-2019. as well as on her official main webpage and on her official social media accounts. So bookmark that page and check it periodically for updates, and for new excerpts. So far Diana has released over 40 excerpts, aka “Daily Lines,” which are short passages from the new book. They do contain minor spoilers. Diana posts the excerpts on her official social media accounts (on Facebook and Twitter) and her BEES webpage. It is easier to find them all on the BEES webpage since they are all listed by a temporary title, which gives you an idea of what each excerpt is about. And Diana has mentioned there will be a book ten eventually, likely the last in the major series of Outlander novels. Book Ten does not have a working title yet. After that, she has several projects planned including a prequel about Jamie’s parents, and a novel about Master Raymond, among others. I am thrilled to hear there’s going to be a book about Master Raymond! I find him very fascinating. I’m glad to hear that Diana will be working on a book on Jamie’s parents. I’ve been thinking that I’d like to know more about his parents’ life and Jamie before his mother died. What it was like for Jamie on the day she died. Was he able to see her and what she might or might not have told him. 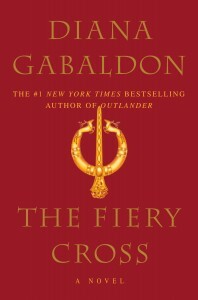 Thanks for posting the beautiful excerpt from “The Fiery Cross.” I’m reading it now. I cannot wait for Book 9 (and #10) but I have patience as I know how hard Diana works at writing these, all the researching, etc. so you don’t rush a good thing! I will be sad to see the major books come to an end, but am very excited for these other projects – as in Master Raymond and Jamie’s parents. I always love learning more about the characters in her books. Plus it leaves time for me to reread the other books, something I’ve done several times and never tire of doing! Thank you for these books! Now that we are into the next installment of “Droughtland” a new excerpt would be most appreciated. I know from my own reading that there is some interesting history of the “mountain folk” being raised and dealing with a force of Cornwallis’ at Kings Mountain (battleground, October 7, 1780). This was where some retribution for Banastre Tarleton’s many abuses of surrendering Continental troops resulted in the term “Tarleton’s Quarter”. These activities during this period would be ones that most affected Fraser’s Ridge occupants and would have turned the rest of the residents into greater sympathy for the rebellion. Wherever she goes, I am eagerly awaiting any scraps that may be tossed my way! I love reading these extracts. Thank you. I’m off to Scotland this year and I look forward to seeing those beautiful places you so beautifully describe.